With the season looming and the decision to name the next captain for the Buffalo Sabres around the corner, we take a final look at what got us this point in the history of the Sabres captains. Up to this point, 11 players have had the distinction of being captain for this team and as you will see plenty of more to come. As we already know, the Sabres ended the 90’s with a nasty contract dispute with Mike Peca, a bitter end to one of the best Stanley Cup Finals with “No Goal”, all followed by the Sabres owner heading off to prison for embezzling billions from Aldelphia Cable. Times were changing and not for the better. The NHL stepped in and took over control of the team until they were able to secure a new owner. Even with that the Sabres were enroute to three straight seasons out of the playoffs. Oh right there was a lost season in their too with the lockout in 2004-05. 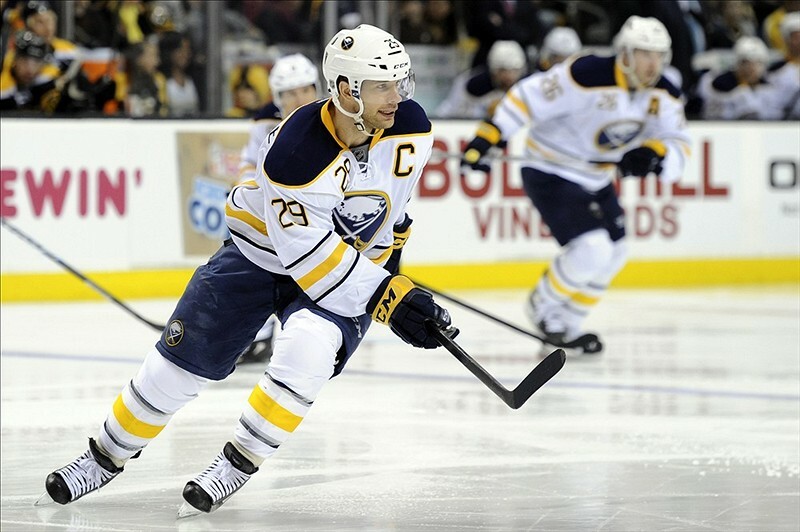 The Sabres would come back in a big way with two straight Conference Final appearances. I digress. Taking over for disgruntled and shipped out Mike Peca, Stu Barnes was next in line as captain of the Sabres. Barnes was an original draft pick of the Winnipeg Jets, playing in parts of three seasons for them. He would have stops in Florida and Pittsburgh before finding his way to the Sabres. Buffalo traded agitator Matthew Barnaby to the Pens to acquire Barnes’ services. When the Sabres acquired Barnes from the Penguins, he already had a 30-goal season and a 20-goal season under his belt. He scored 20 in his first season with Buffalo but was unable to play an entire season after that. He had the challenge of taking over the leadership role during some real tough times. Unfortunately for him, the Sabres wouldn’t make the playoffs with him in that role, but he remains a favorite of Buffalonians. Barnes would eventually be traded to the Dallas Stars at the trade deadline in 2003. Buffalo acquired Michael Ryan and a second round pick in the 2003 draft which they used to select Branislav Fabry (who never made it to North America). With new ownership in place and the idea that the Sabres were going to remain in Buffalo, the Sabres had difficulty finding just one player to take over the role. In an idea that didn’t work (in my opinion), Buffalo decided to have alternating captains from month to month. In the defense of the idea, I think it was designed to let a player emerge to take over the role for good. It didn’t happen. The first player to be named captain in 2003 was Miroslav Satan. After acquiring Satan in a trade with the Edmonton Oilers in 1997, all he did was become a perennial 20+ goal scorer. He was able to hit the 40-goal plateau once and scored 30 or more twice. Satan didn’t really fit in the leadership role with the Sabres. At times it appeared as he was just going through the motions out on the ice and eventually left Buffalo after the lockout when the Sabres didn’t offer him a contract. He would play for the Islanders, Penguins (winning the Stanley Cup), and Bruins before heading over to Europe to finish out his playing career. The next player to be the captain is one that should have never had it taken away. Chris Drury was named the second captain of the 2003 season for the Sabres. Drury was traded to the Sabres in July in 2003 and was an instant favorite. His heart and hard work on the ice seemed to emulate what Buffalo was all about. He scored 71 goals in his three seasons with the Sabres and should have been a lock to remain with the franchise for the rest of his career. Drury would wear the “C” two more times with the Sabres before signing a free agent deal with the New York Rangers in the black summer of 2007. 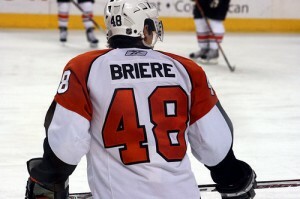 The other three players that would alternate as captain in 2003 were James Patrick, J.P. Dumont, and Daniel Briere. Briere, along with Drury, were a huge part of the success the Sabres had in the middle of the 00’s. He would also serve as co-captain with Drury from 2005 to 2007, and would also not re-sign with the Sabres in 2007 and defected to the Philadelphia Flyers. After a relatively unsuccessful alternating captain plan, the Sabres, who still couldn’t decide, made Chris Drury and Daneil Briere co-captains. The only thing these two would do during that time period was win. The post-lockout Sabres were built for the new rule changes the league made during the lost season of 2004-05. Buffalo would make two Conference Finals appearances before missing out on the postseason five of the next seven years. As previously mentioned both players left Buffalo and headed elswhere. It seems as though the Sabres never really recovered from losing one or both of these players. 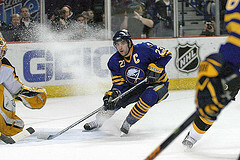 Since it was so successful before, the Sabres went back to alternating captains after the 2007 season. Jochen Hecht would hold the position twice that season, and would share it with Tony Lydman, Brian Campbell, Jaroslav Spacek and Jason Pominville. After winning 50 games the previous two seasons, the Sabres would win 39 and set their course for mediocrity. The Buffalo Sabres acquired Craig Rivet in the summer of 2008. As soon as that happened he was named captain and would hold that role until he was forced out due to injury. Rivet was the kind of player the Sabres needed to lead the team, and brought them back into the playoffs after a three-year absence. Rivet would be placed on waivers by the Sabres in February of 2011 due to his continue slide in performance and would play in the American Hockey League for then affiliate Portland Pirates. He would be claimed on re-entry waivers by the Columbus Blue Jackets in 2011 and would play 14 more games in his NHL career. So many changes have come in history of the Buffalo Sabres. From their entrance in the league in 1970, to their first Stanley Cup appearance in 1975, to the “No Goal” Triple Overtime winner from Brett Hull in the ’99 finals, to ownership changes, stability in the captain role was a must. Jason Pominville was part of the second installment of alternating captain, and would be named permanent captain in 2011. He would hold that role until being traded away, like so many captains before him, during the 2013 season. The Sabres decided to go for a full-out re-build and are still in the process. A player with Pominville’s talent, was able to net the Sabres a nice return which will aid the Sabres in their efforts of building a winner. As I mentioned all the way in the first part of this series, there have been a couple of names thrown out there to take over the role. Newcomer’s Brian Gionta and Josh Gorges look to be the possible favorites. There may be some dark horses in the running which we will find out in the coming weeks once the announcement is made. Once he was signed this offseason, Brian Gionta was who I thought would take the role. He is the guy that has plenty of experience and would be a good leader for a very young team. The other possibilities would be good too but I feel that Gionta would be the better choice. It is going to be an interesting transition for this franchise moving forward.